If no substantial efforts are undertaken, 17% of CO2 emission will be on the account of sea transport globally by 2025. In order to reach the Paris Agreement goals, CO2 emission will have to be reduced by 80% within the next 10 to 15 years. The global fleet will have to be reformed to reach this aim. Windship Project suggests a concept of a modern sailing freight carrier to achieve this. Within the Windship Project oncept, several ships have been designed which can be utilized in various trades. Windships are real sailing ships, no motor sailers. Which is why the experience from the past is on the origin of Windship designs. 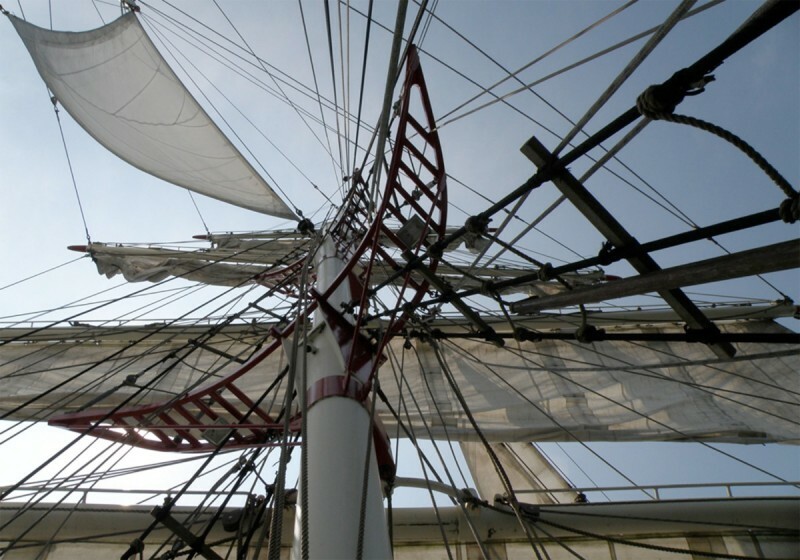 The fastest and most efficiently designed sailing ships were built in the 19th century. 1. Small freighters up to 500 BRT: a brig, a schooner brig, and windrose which is a modern schooner brig based on the design of a very fast schooner. 2. Wind frigates and wind barques. These ships are based on the design of medium clippers. Loading capacity will be between 1000 en 2000 tons. 4. Ships were being built larger and larger by the end of the sail age, when steel and composite construction were used. The ships were over 100 meters long and had a loading capacity of 5000 tons. hull lines, sail plan, general plan, deck plan, loading plan, technical data, Ron’s Rig, an adaption of the polar design and an itinerary plan. 1. A windship file is a strong tool to invite others to examine the possibility to build a CO2-neutral freight carrier. 2. A windship file enables companies, shipowners and freight transporters to invite gouvernment parties to discuss the way to realisation. On the other hand a city or port may invite a commercial party to investigate possibilities to promote the city’s goals of sustainability. 3. Shipowners may invite designers to elaborate the plans. 4. Shipowners wishing to transport sustainable goods in a CO2-neutral way may invite shipowners to discuss the materialisation of the plans in the file. 5. Shipowners may use the file as a tool to convince financial parties to support their plans. 6. Shipowners may use the file to convince potential financers to support their project financially. What a marvellous ( and romantic) idea. Wonderful if it catches on! Potential investors and builders are more than welcome! Als ik mij t.z.t. redelijk gezond voel, vaar ik graag een keer mee. Geweldig idee!